Many Stearns and Foster mattress reviews state that they are not really worth the hefty price tag. Now, innerspring mattresses in general almost always receive a high percentage of poor reviews, so you have to keep that in mind. They are more prone to manufacturing defects and it can be hard for people to find the firmness level that suits them. However, traditional spring coil mattresses still dominate the market over memory foam, latex, air or waterbeds and that's because most people like and are satisfied with them. It's a basic fact of human psychology that people are much more likely to post a bad review if they feel cheated or dissatisfied with their purchase than they are to post a good review when they're happy. So to some extent this explains the prevalence of negative innerspring mattress reports. Unfortunately, with Stearns and Foster, we're talking about a high priced luxury line of mattresses and when people pay that much and are not satisfied they tend to be even more vocal than usual. Stearns and Foster mattresses are marketed by the Sealy Corporation, which claims to be the largest mattress manufacturer in the world. Their products are designed to be high end and cost a great deal of money. However, as will become evident from reading Stearns and Foster mattress reviews, some people feel this brand is more about appearances than functionality. One good quality of these mattresses that has been mentioned by virtually everyone who has used them is that they have a magnificent look. They are built in a way that displays the royal experience a customer would expect from a product this expensive. 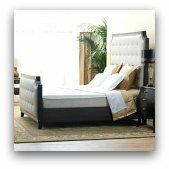 Consequently, a prominent quality of Stearns and Foster beds is their beauty and exquisiteness. However, some people think these mattresses are mostly just about beauty and less about durability. As detailed in many Stearns and Foster mattress reviews, the biggest problem people face is that after a certain amount of time these mattresses start drooping. While it's logical to expect any mattress to show signs of fatigue through sagging, quite a few of the company's products seem to show them well before the average time. The most surprising aspect of the sinking problem is that even their top end model which costs in excess of 4,000 dollars sometimes exhibits it. Another alarming report that is not expected from a luxury mattress would be that some customers have suffered this problem of sagging around the three year period of ownership. In simpler terms, some of the mattresses go south by the third year of use, if not earlier. Even though the sagging problem has been the central theme in many negative Stearns and Foster mattress reviews, some have included problems from the mattresses developing deep depressions. While some body impressions are considered normal after regular use, these depressions seem to be more severe and can cause pain and related posture problems in the people who are sleeping on them. The pain caused by this issue, when reported, is usually enough for the customer to be dissatisfied and switch to other manufacturers and products. While some people have mentioned in their Stearns and Foster mattress reviews that the dipping problem has been dealt with by the company under the warranty, others have stated that the warranty does not provide enough coverage for their problem. This results in the customers being stuck with what they feel to be a faulty mattress. And this, of course, leads to them being extremely unhappy with the customer service of the manufacturer. Now mattress warranties are a sticky subject in general. Nearly all of the major manufacturers have fairly strict terms regarding how deep the depressions have to be (usually around 2 inches) before they will replace the mattress. This is because body impressions are considered normal, especially with the soft (and usually cheap) foam found in pillowtops. But if a customer finds the depressions extremely uncomfortable, and the manufacturer won't do anything about it because they're not deep enough, then the customer is usually not too happy. On the other hand, when it comes to motion separation, these mattresses do receive good reports. Motion separation can be defined as the property which prevents the movement of one sleeper from disturbing the other. In terms of the quality of motion separation, Stearns and Foster mattresses seem to fare quite well with the majority of customers. The above mentioned pros and cons of Stearns and Foster mattresses are relevant for most varieties in most segments and purchasing more expensive models does not necessarily mean that the customer will not have problems. However, the pillowtop variety, as with most innerspring mattresses, has been known to be especially susceptible to the problem of sagging and developing depressions. If you've read any of our other innerspring mattress reviews then you probably know by now that we always advise people to stay away from pillowtops. The only exception to this is if the pillowtop contains high quality latex foam which will be much more durable. This is rarely an option but may actually be available in a high end Stearns and Foster latex mattress. All of these problems and negative reviews, when combined with the high cost of mattresses from Stearns and Foster, make it difficult to recommend them, even if you take into account their positive characteristics such as motion separation and fine upholstery. Stearns and Foster is owned by Sealy which is a big name brand with a good reputation. We'd like to give them the benefit of the doubt and assume that the silent majority of Stearns and Foster owners are satisfied with their purchases. However, based on Stearns and Foster mattress reviews from customers all over the country, we feel obligated to advise you to think twice before purchasing. Also, as with any mattress purchase, make sure your retailer has a comfort guarantee of some sort so you can return the mattress if you don't like it. The manufacturers warranty never covers comfort issues. Have You Owned A Stearns and Foster Mattress? Would you recommend one to others? 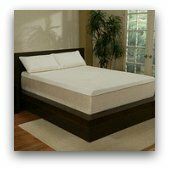 Share your Englander mattress reviews here! Is your mattress firm, plush, or a pillowtop? Does it have innersprings, memory foam or latex? How much did you pay for your mattress? Has it held up well over time? Would you recommend your mattress to other visitors to the site? Anything else you would like to share about your experience? A photo of your mattress would be great but is not required. Which model are you writing about? In celebration of the premier of our new Facebook page we'd like to introduce a monthly mattress review contest! Whoever writes the best review each month will win a $25 Amazon gift card. Check out the rules and specifics at our Consumer Mattress Reviews page. And don't forget to check us out on Facebook!